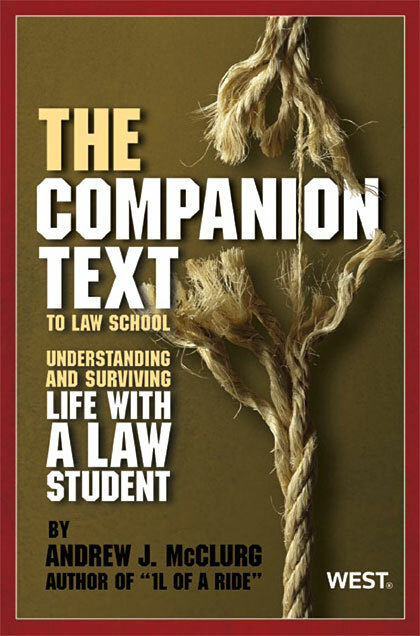 For new readers who came to this blog because a friend or family member is about to start law school, let me renew a book recommendation that I make each year–for YOU, not the new law student! 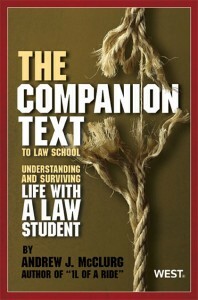 Professor Andrew McClurg from the Cecil C. Humphreys School of Law at the University of Memphis authored a book titled, “The ‘Companion Text’ to Law School: Understanding and Surviving Life with a Law Student.” If you are interested in a thorough book that will be helpful from “your” perspective, then I definitely recommend this book. HERE is a link to the book if you are interested in purchasing it. Our spring break ends today, and the final stretch run begins on Monday. The last couple of months will pass quickly. Non-law school loved ones need to understand that law school is a totally unique educational experience unlike any other undergraduate or graduate level program, and success in any other program does not necessarily mean that the student will succeed in law school. They should understand that it is an enormous time commitment that must take priority if one is to succeed. The loved one should understand that there is tremendous pressure that comes with an entire grade riding on one final exam. Work cannot be delayed or done later. A law student cannot get behind. My intent today is not to debate whether this is good or bad, healthy or unhealthy. Instead, I simply want you to know that the pressure is strong, and it is real. Chapter 14 of Professor McClurg’s book is titled, “What Law Students Want You to Know.” There are seven topics included in this chapter, and I may hit several of them with a blog post over the course of the semester. Today, I will mention one: Law School Classes and Class Preparation Are a Different World. To me, the most telling quote in Professor McClurg’s description of this concept is, “Going to class is like taking a test every day.” I would add that, because students go to class multiple times in a given day, it feels like taking several tests every day. Now, truth be told, you rarely are put “on the spot” in a law school class, but the possibility is always there, so you are constantly aware that you have to be ready. The undergraduate experience consists of several (if not, most) classes where you can successfully hide. Not law school. It is a different world that requires constant, thorough preparation. I encourage law students to take time for exercise and things unrelated to law school. You would think this is an easy sell, but for many, it is not at all. The ever-present need to prepare means that students often have to literally carve time out of their schedule to relax! I hope you catch the irony — it takes work for many to relax! I think Professor McClurg is right — that students want you to know that their new educational experience is different than anything else they have done in the past. When your student seems consumed with law school, realize that this is a natural phenomenon. Resist the urge to advise them to take time off (although you are on to something, they will simply think: You don’t understand!). Instead, maybe suggest they go visit with Dean Sturgeon sometime. Chapter 9 of Professor McClurg’s book is titled, “Eight Things to NEVER Say to a Law Student.” Excellent, excellent advice there! I’ll share half of them today with my own super brief synopsis (Professor McClurg’s in-depth descriptions are much better, of course! ).